The course provides students the chance to develop knowledge in topics such as communication, teamwork and cultural competence. Travelling provides the opportunity to apply this learning in an international setting. Students who choose to go to Germany will visit industry, partner universities, and cultural sites that are famous around the world. 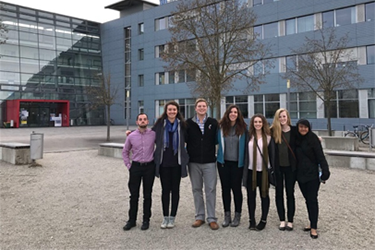 UC and the College of Engineering & Applied Science have partnerships with several universities in Germany, including the ones described in the following links. Our partner universities provide opportunities for student exchange, collaborative degree programs, and collaborative research. Qualified students have the opportunity to spend an academic semester or two and perhaps a co-op semester at one of our partners. Check with your academic advisor or Prof Rutz if you are interested. 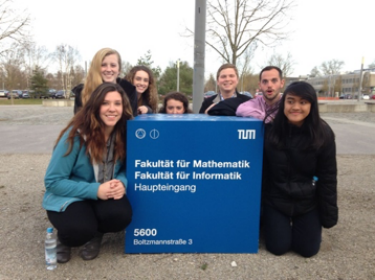 We visited the Technical University of Munich (TUM) Downtown Campus and Garching Campus. We went on a tour of both campuses and the TUM International Center Staff gave a presentation about their university to us. We learned a lot about university life in TUM. Unlike in America, it is extremely hard to change majors in German universities. If a student did change majors, he/she would have to start from the first year of their new major, losing all the time he/she has invested in his/her previous major. Furthermore, classes in TUM are never graded on attendance, which is different from American universities where you could get in trouble or suffer repercussions if you skipped certain classes, depending on your professor. TUM also hosts a welcoming party to first year students, in which the President of TUM will serve and drink beer with the freshmen. Beer is a very integral part of German culture. This is very different from the strict policies American universities have about alcohol. We would never see a picture of our President Pinto drinking alcohol with freshmen. In addition to school life in TUM, we also learned a lot about the education system in Germany. There is a huge emphasis and priority on STEM majors in Germany. People who have STEM majors and jobs are highly respected in society. The fact that Germany is known for its achievements in Science and Engineering could have added to this. Furthermore, the educational opportunities that a student has depends on how he/she performed as a ten-year-old. Based on their academic results in elementary school, students are placed in three different tracks for students headed for college, average or better white-collar positions, and trades and blue-collar jobs. Although it is possible to switch tracks, it is not very common. This is very different from America’s education system where students are not placed in different categories based on their performance when they were young. Other students should have this experience because it is a great opportunity to discuss and learn about education in another country, as well as be more aware of the education we have in America. Are you interested in learning more about the metal tubes that fly in the sky? Don’t know what I’m talking about – Keep Reading! A Bundeswehr military aircraft located right outside of the MTU offices. The MTU logo can be seen on the tail of the craft. A visit to the MTU Aero Engines facility will be an experience like no other. You’ll have the opportunity to take a walk through the history of airplane engines in the one of a kind museum located on MTU’s grounds. This museum, only open to the public 4 days of the year, showcases mint condition engines and past products of MTU manufacturing. Some of the earlier engines are the last remaining exact replicas in the world. Take a tour of the manufacturing facilities, and get a taste of how MTU creates the pieces of the engine puzzle! Learn more about the manufacturing process, the people, and the machines. Want to learn more about the think tank behind these ideas? Ask about the 3-D printer room and hall of fame! Testimonial: My visit to MTU was eye opening. You see airplanes everyday, but its not everyday that you get to be this close to the engines, to really analyze the pieces or ask the professionals any questions that you might have. It is quite mind boggling to think that these small pieces are what helped you cross miles of land and sea to be where you are today. Thinking of how many people had to do research on the idea, before they had to present the idea, build a prototype, test the prototype, how many people had to design and build the machines that would make the products…I could keep going. It is amazing when you start to think of the process backwards; the complexity of the companies, the legality of production, product, and location, the costs associated with everything, the environmental aspect for the final product, the manufacturing facility, everything has to fit together or something could go wrong. Visits to manufacturing facilities help you realize that you are one piece in a HUGE puzzle. Everything you see or touch was created using meticulous processes that involves hundreds if not thousands of hours to create. Every student should take this opportunity to visit another country and culture. You will make unforgettable friends, see landscapes and architecture that will leave you speechless, and eat foods that you will yearn for when you get back to the States. Immerse yourself in a place like no other. See the Alps, hear the language, walk the streets that were once roamed by Kings and Queens. Open your eyes to ideas that weren’t thought of before. Take this chance. Paige and Jon pose with the front of an engine fan. Jon is 6’2” and Paige is 5’7. During our trip to Germany over spring break in 2017, our group had the opportunity to visit Austria. We took a train from Munich into Kufstein early that Saturday morning. We walked to through the town to the trailhead of the Ebbs Kaisertal. We began our hike with a long stretch of steep stairs. The weather was great for the hike and we were pleasantly surprised as we were all prepared for rain. As we progressed up the mountainside, we passed several other hikers taking on the trails. One of the best parts of the hike was making it to the area shown in the photo below. Most of the trail was lined heavily with trees, but this spot was a clear view of the beautiful sights of the Alpine mountains lightly coated in snow. Needless to say, we all stopped for a photo opp. We then advanced a little further where there was a small chapel and a small lodge/restaurant to stop for some food. We had packed sandwich supplies and other snacks, so we sat and had a nice lunch break. Shortly after, we started the last leg of the hike and we came upon some snow. After another hour and several more pictures we made it to the Vorderkaiserfeldenhütte, where we found more kind travelers and an even better view of the mountains. We arrived there in the early afternoon and spent the next few hours hanging out in the hütte, playing some games, and relaxing. We also met a new friend, Laura. She was a 4-year-old girl who lives at the hütte with her parents who work there. We had a wonderful dinner and continued to chat and play games. The next morning we had a traditional European breakfast at the hütte then hiked back down the mountain to Kufstein. It was a faster trip down, but I think we were all sorer from that part of the hike. We walked back to the train station, finding some ice cream and souvenirs along the way. We made our way back to Munich with sore legs and full hearts. I learned so much from this part of the trip, about our group and about being a global citizen. Communication is such a special and interesting thing that we share as people. I also learned that communicating with one another doesn’t just happen with the words we speak. Language was as clear challenge we faced not just during our trip to Kufstein, but throughout the trip. However, that didn’t stop us from learning and enjoying our time in Germany. This was very evident through our interactions with some of the hütte staff and Laura. We spent a long time with Laura playing and chatting, even though we didn’t speak the same language. This helped me to remember to be more empathetic and open in future situations of communication with others from around the world that have different cultures and languages. This was such an amazing experience; I would definitely recommend this type of trip to any UC student even considering it. 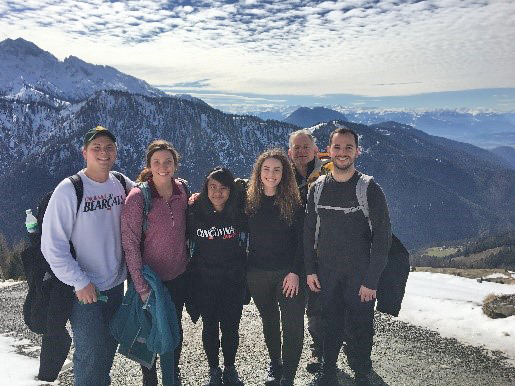 We got to experience the beauty and challenge of hiking in the Alps and meet new people. This was just one highlight of a great 10-day trip. This is an ideal length of time to spend in a small area of a new place that is so rich in opportunity and culture. Being exposed to a new part of the world helped me to realize that there is so much left to experience. I hope others will take advantage to opportunities like this offered to them at UC. I can’t wait for my next adventure! We visited the Technical University of Munich (TUM) Garching Campus and the TUM Center for Key Competencies. This Center provides workshops to develop soft skills of students and teaches about conflict resolution, creativity methods, presentation techniques, inter-cultural communication and team work. It aims to prepare students for a successful start in business lives since soft skills are expected when they enter the workforce. We participated in a ‘Doing Business with Germans and Americans’ Workshop in a small group setting with one other German student. We learned a lot about Germany culture such as how Germans are very conservative, orderly, timely, blunt, direct, detail-oriented, logical, efficient, and traditional. In addition, we discussed about how they work in a formal work setting, prioritize a clearly defined work-life balance, and separate their friends from their colleagues. We compared these characteristics with those of American culture and realized how different Germany and America was. In comparison, Americans prioritized personal relationships, emotions, freedom and individualism more than Germans. These discussions opened our minds and made us realize how big the world is and how different people and life is in different parts of the world. I also appreciated that there is always something good to learn from every culture, such as we can learn from how efficient the Germans are and how personal Americans are. Other students should have this experience because it is a great opportunity to discuss about culture with other German students to get an outsider’s perspective. It is also a chance to apply what we learned in ‘The Global Technical Workforce’ class. On our cultural day, I elected to go to the Munich Technical Museum. This was an all-morning event as it encompassed decades of technological advancements in countless topic maters. We toured the museum at our leisure and explored how technology was innovated over the years. We looked at aviation, ocean transportation, power generation, environmental, machinery, musical instruments, and many more topics. This visit taught me that innovation is never complete. Each iteration of a piece of technology was thought to be the most advance, the best, and the pinnacle. But without doubt, that product (a masterpiece in it’s time) was surpassed with a better, more efficient version. Engineers and other technical people kept working towards innovation. Furthermore, a lone worker developed none of these technologies. It takes teams of workers years to develop such innovation and more often than not, especially in today’s workforce, these teams require global collaboration. If the team isn’t inherently global, the impact sure is. The items in this museum all had such a global impact. Whether it be bettering the world’s environment through population and carbon-usage tracking or uniting the world through global transportation over land and sea, the impact of these technologies had and continue to have an incredible global presence. When developing these technologies, you are not an employee of a company or an individual researcher; you are in service for the whole world. The entire globe will feel the impact of your work. Art museums are nice and very introspective, but a technical museum is something completely different. I would highly recommend attending a technical museum at some point to see first hand where our technology began and just how far we have come in such a short period of time. It will open your mind to the thought that innovation is never finished.